With St. Patrick’s Day falling on a Sunday this year, it’s going to be a weeklong celebration at O’Sullivan’s in Carlsbad Village. O’Sullivan’s is one of the more authentic Irish pub type establishments in coastal North County and it draws a diverse variety of folks, which is just how I like it. During a recent Friday night dinner and Saturday afternoon recording session, I encountered a mix of regulars from all walks of life, military, couples, and a pub crawl consisting of fit, attractive middle-age folks on a day-drinking adventure. Owner Dennis O’ Sullivan is one of those genuinely nice guys with a flare for storytelling which makes him a perfect fit as an Irish pub owner. Dennis was born and raised in Long Beach, California and spent 40 years as an attorney. During that time he became a restaurateur and has owned several in Orange and San Diego Counties. Coastal North County has always been a preferred destination and that came to fruition a few years back when he purchased what was formerly Tom Giblin’s. He also has a very similar O’Sullivan’s in Escondido. He has settled in nicely and is known for giving back to the community through various local charitable endeavors. So we can’t have a conversation about an Irish pub without mention of a perfectly poured Guinness. First off, if you ever order a Guinness and it is poured and delivered quickly, your bartender has not been educated on the correct pour. 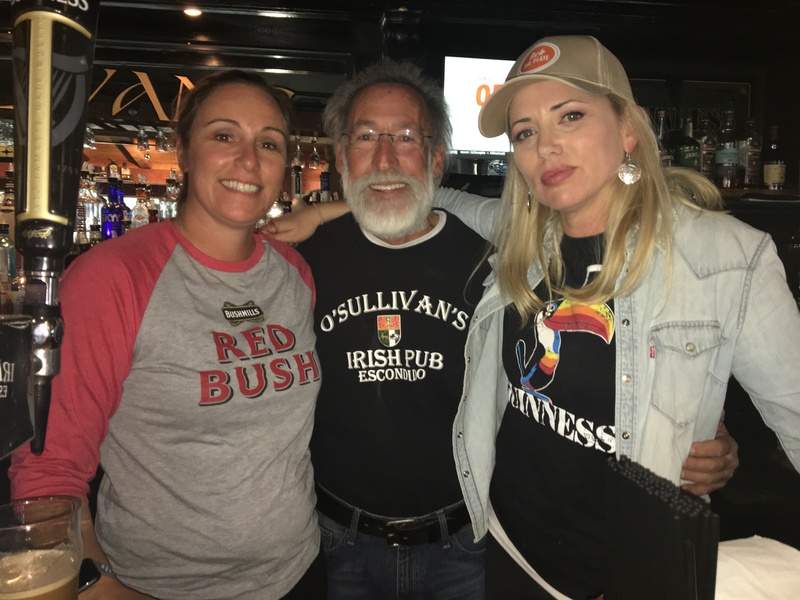 Kat Derr and Jennifer Angleo are manager/bartenders at O’Sullivan’s and are well schooled in the art of the perfect pour of Guinness. Pour at 45- degree angle, let it settle, and finish the pour…119 seconds if you are counting. One exception to this is on days like St. Patrick’s when it’s a high volume affair and they tend to pre half-pour a dozen or so at a time then finish them on demand. Besides Guinness they have a nice selection of imports on tap like Harp and also a nice mix of local craft beers. The traditional Irish fare is found in abundance on the O’Sullivan’s menu and it’s spot on when you have a hankering for some solid food to fill a big appetite. Corned Beef & Cabbage, Bangers & Mash (Irish pork sausage with mashed potatoes and Heinz baked beans), Fish & Chips, Guinness Irish Stew, Shepard’s Pie and one of my favorites, the All Day Full Irish Breakfast are all part of the Irish offerings. For those unfamiliar, that consists of eggs, Irish rasher, Irish sausage, tomatoes, black and white pudding, baked beans, cheese potatoes and Irish soda bread. During my travels to England and Ireland I found this breakfast would literally satisfy my hunger up until dinner, and was also a fine meal for a hangover with a planned nap after. A good way to sample many of these dishes is to go for the Taste of Ireland. With that you get a cup of Shepard’s Pie, Irish Whiskey Chicken Boxty, Corned Beef & Cabbage and a cup of Irish stew. It’s a fine way to get smaller portions of many Irish favorites. There are some American pub food options on the menu as well including some fine burgers, a Reuben, Buffalo Wings, fish tacos and more. Wicked Wine Wednesday’s also happen with half off house wine and appetizers for both lunch and dinner. Public service discounts happen every Thursday with 15% off for military, police, fire and dispatch folks. Live music happens most nights except Tuesday when it’s trivia night. Local favorites Tony Cummins, Clay Colton, Jamie O’Connor, Jeff Brinkman, Brick Top Blaggers, and Highland Way are among the performers booked on a regular basis. There is a limited menu on St. Patrick’s Day because as you might imagine it’s where everyone wants to be. Doors open at 10:00 a.m. and Clay Colton takes the stage from 1pm – 5:00pm then again at 7pm-11pm. I would suggest arriving early to partake as it’s going to be a big day at O’Sullivan’s. Besides the St. Patrick’s Day celebration, this is a place I’m going to pop back into on a regular basis. It’s a charming place with a great mix of people, hearty food, and a perfectly poured Guinness. This is my kind of joint for sure.